Tom Stewart looks set to return this week. Tom Stewart and Rhys Stanley will return, but defender Jed Bews remains a long-shot to play in Geelong's crunch clash with Hawthorn on Saturday at the MCG. Ahead of the date with Hawks small forwards Luke Breust and Paul Puopolo, Bews ran laps away from teammates during Thursday's main session at Deakin University. While the defence will be bolstered by Stewart's availability, Bews' hopes of recovering from a shoulder injury sustained in the dying stages of last week's loss to Richmond appear unlikely. "Not sure yet, we're pretty optimistic that he's escaped serious injury," coach Chris Scott said before training. "Whether he's good enough to play this week, we're not exactly sure, but we haven't ruled it out." One potential option down back looms as star midfielder Mitch Duncan, who trained alongside defenders on Thursday. Stanley took part in match simulation, playing for a 'blue' team that resembled close to Geelong's best 22, which included swingman Jack Henry as a forward. Despite an impressive debut last week, mature-age ruckman Ryan Abbott – who played for the opposing 'green' team – looks set to make way for Stanley's return. While Scott said the 10-year rivalry with Hawthorn wouldn't be used as extra motivation, he hoped his players would rise to the challenge and keep destiny in their own hands. 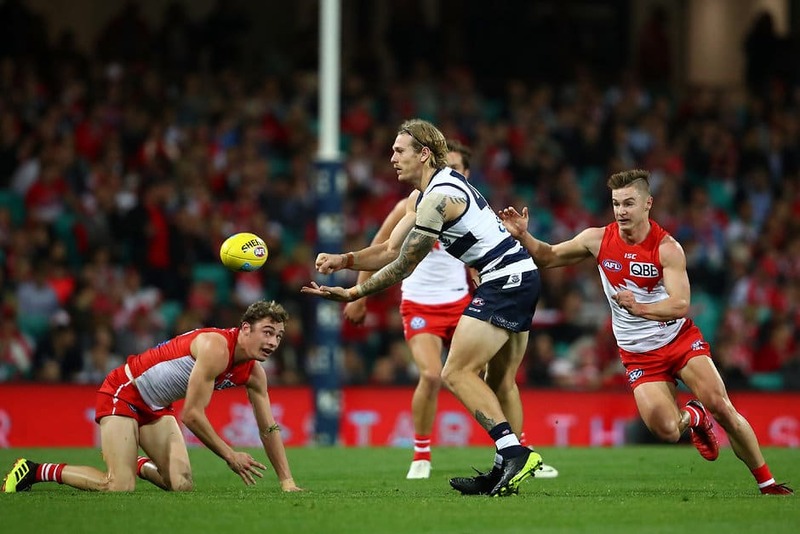 Winning the final three matches against Hawthorn, Fremantle and Gold Coast would ensure a top-eight finish, while a loss to the Hawks would mean the Cats need to rely on other results. "We do promote the fact that we like players who enjoy the big moments in the big games against the big opposition on a big stage," Scott said. "That's the part we don't want to shy away from. "I don’t often say this, but if you go back over a long period of time, the personnel doesn't seem to matter too much when we play the Hawks. They're generally tight games. "The spectre of a tight game, with a lot on the line, means there'll be a bit of pressure and big occasion. "I think our guys are excited again to get the opportunity to put themselves in that sort of position." Scott indicated Patrick Dangerfield would spend parts of the game forward, having kicked seven goals in the past two clashes with the Hawks decided by less than a kick. Harry Taylor re-joined the main group for the first time after a tendon setback in his foot, but still remains at least one week away. "It's a little bit early for Harry," Scott said. "He hasn't played any footy at all for a while, he's really only got back to training this week, we won't rush him back into the team." The dual All Australian played in attack for green team alongside Esava Ratugolea, who joined in match simulation for the first time since his round 10 broken ankle. When asked on Ratugolea's chances for a comeback this year, Scott said he was "mildly confident." "(I'm) getting more confident the more I watch him, I've got to stop watching him so closely because he looks really good," he said. "The one thing we've guaranteed is that we won't be premature with his return. "I'll try and watch him a little less closely because the more I watch, the more likely I think he is to come in and play with us at some stage." There was a fresh face spotted on the training track, father-son prospect Oscar Brownless joining in match simulation as part of his four hours per week with the club. The son of club legend Billy, the 18-year-old is eligible for this year's NAB AFL Draft and even spent time opposed to Joel Selwood in the midfield. Meanwhile, return dates for Lincoln McCarthy (hamstring) and Stewart Crameri (groin) is expected to be stretched into at least another week.